Paris Saint-Germain forward Neymar could reportedly be hit with a three-game suspension in the Champions League next season. The Brazilian superstar watched on from the sidelines as his side were eliminated in dramatic fashion from Europe’s premier competition last week. A late penalty from Marcus Rashford secured a 3-1 win for Man Utd in Paris, as they advanced to the quarter-finals on the away goal rule with the tie locked at 3-3 on aggregate. As seen in the tweet below, Neymar didn’t bite his tongue on Instagram after the game, lashing out at the officials for the decision to award the penalty, with VAR intervening and helping to make the final call. 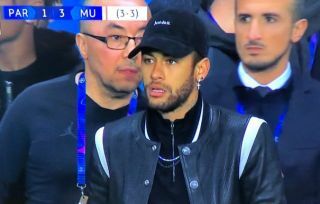 According to The Times, that foul-mouthed reaction below could now land Neymar in hot water, as it’s suggested that he could receive a three-game ban for the start of next season’s Champions League. It’s added that UEFA have launched an investigation into the matter, and the fact that they’ve appointed an official to look into it further would suggest that the disciplinary action, if handed out, will go beyond a mere fine. Should that be the case, that will be a massive blow for PSG as that would potentially rule Neymar out of three of the six group stage games based on precedent set by teammate Gianluigi Buffon, denying their talisman the opportunity to make a confident start to a new campaign in Europe. Given their ongoing struggles and setbacks in the Champions League, being without Neymar is the last thing that PSG need for half of the group stage. Neymar is ranting on Instagram about the penalty decision ???. “Disgraceful. 4 guys who know nothing about football watch a slow motion replay in front of the TV. It was nothing! What can he do with his hand while his back is turned? Go f**k yourselves!"